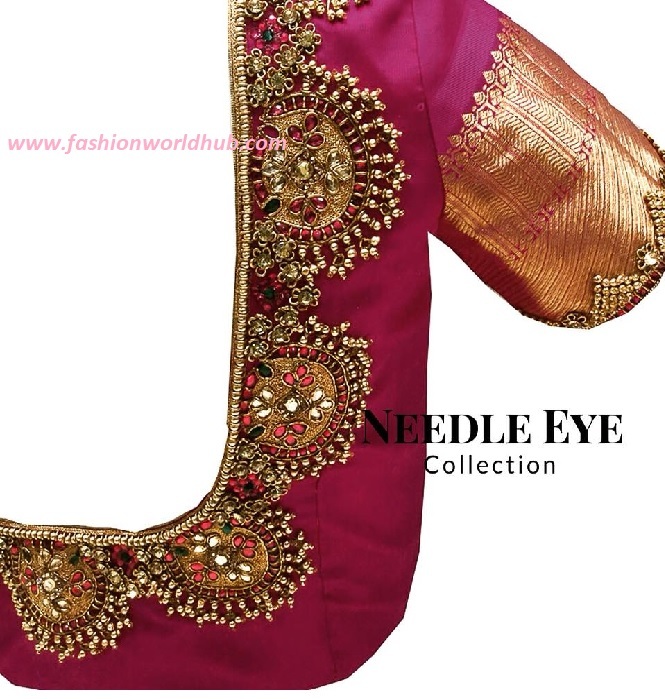 The trend and craze on maggam work blouse is increasing day by day. 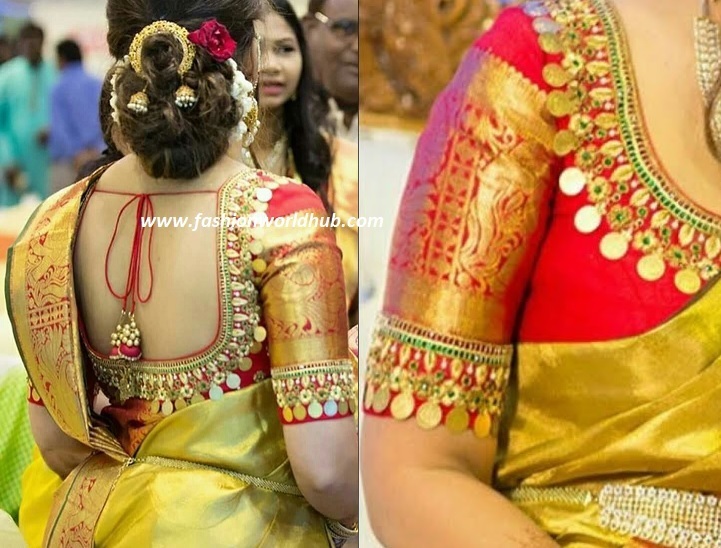 These maggam work blouses go very well on pattu sarees like kanjeevaram sarees, dharmavaram pattu sarees, ikkat pochampally pattu sarees, uppada pattu sarees and in fact on any pattu sarees. 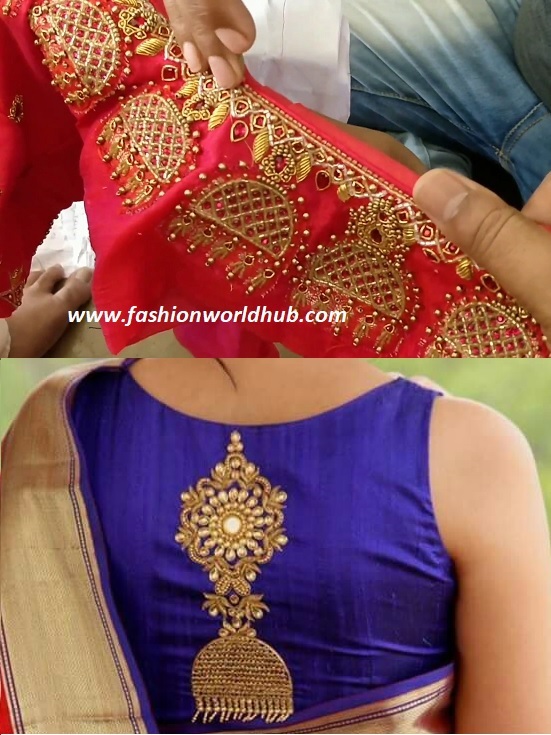 Here are couple of latest maggam work blouse designs which are in high trend. 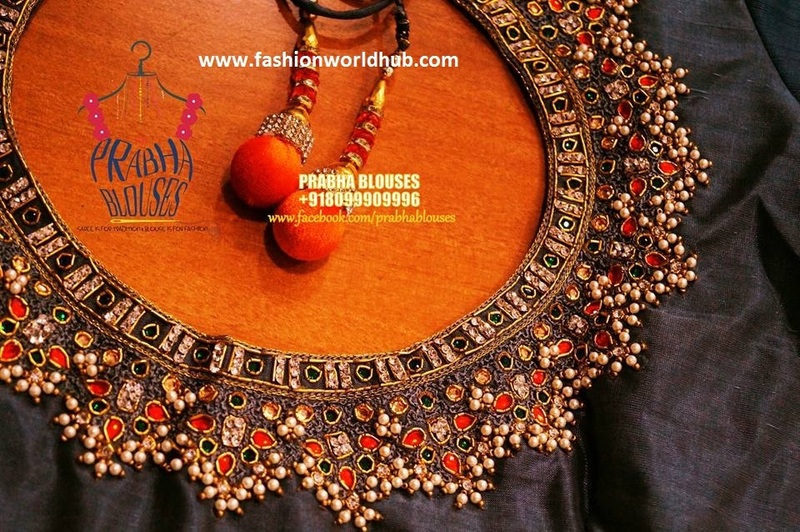 Jewel design blouses are one of the top hit blouses in 2017 . 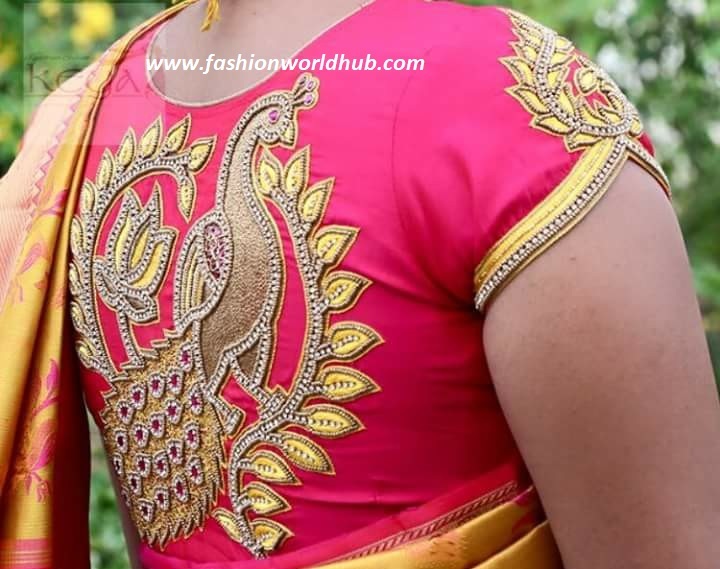 Jewel designs like guttapuslaa blouse, kasu blouse, kundan jewel blouse , Jumkha design blouse chandbali ear rings blouse designs , vanki and many other jewel designs blouses are the Top hit blouses in 2017. 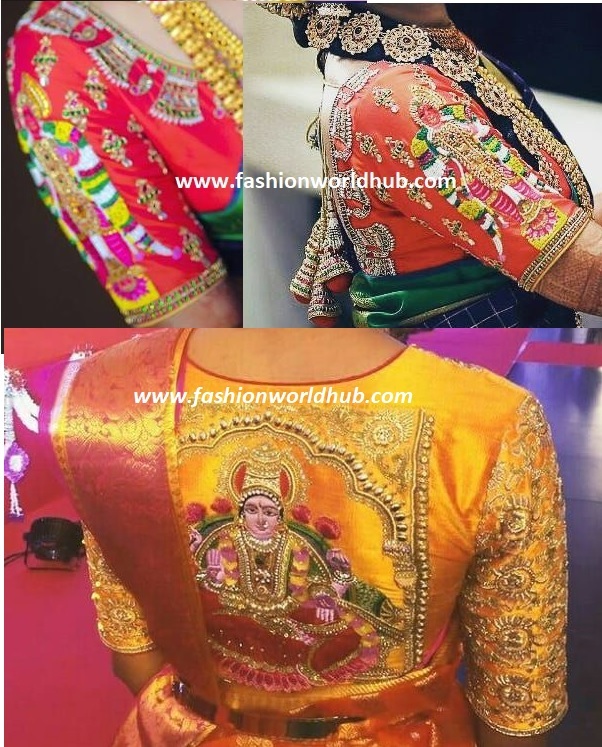 Have a glance of below blouses and i am sure the trend of 2017 blouses will carry forward to 2018 as well. 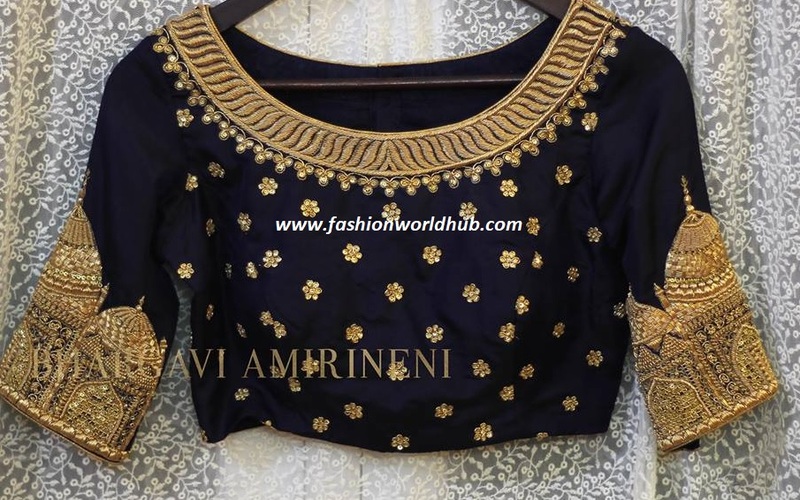 Guttapusala jewel blouse designs :- Guttapusalu is not only trend in jewellery designs this jewel design is trending on blouse as well. 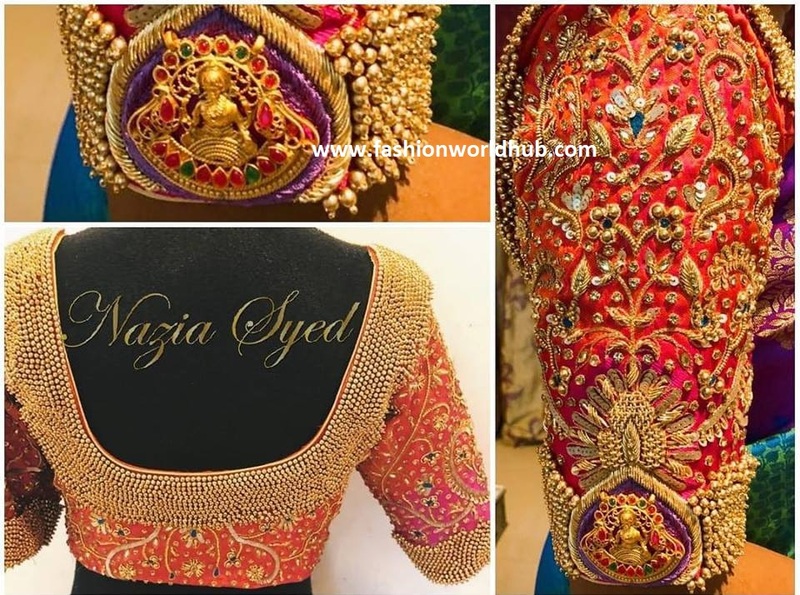 Specially the white pearl drops are the high light of the blouse. 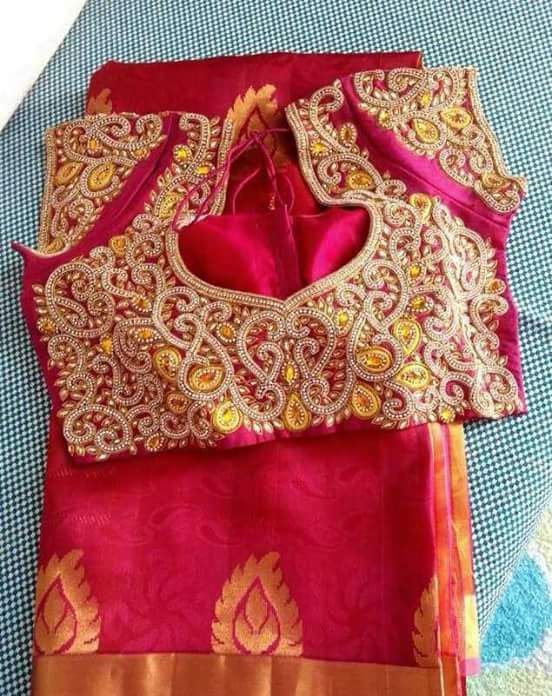 Kasu emebellishment blouse designs :- We all know that with simple kasula haram the complete traditional look will change and the same traditional show we can see in the kasu embellished blouse designs. These blouses are one of the key hit in 2017 and it will continue in 2018 as well. 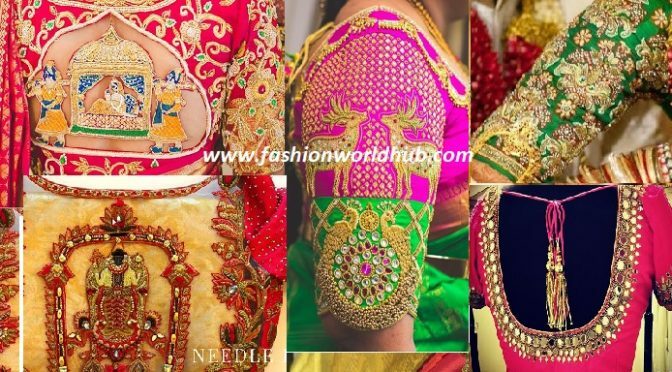 Other Jewel designs like chandbali ear rings design model blouse, jumkhas design blouse , vanki blouse and kundan jewellery designs are the major hit in 2017 and i am sure the trend is going to continue in 2018 as well. 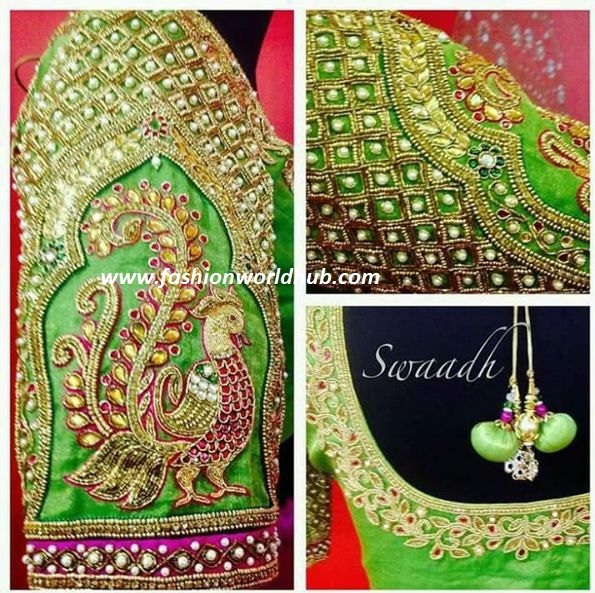 Animal and bird blouses :- Animal and bird designs are ever green trending blouse and i am sure this blouses will never go wrong on any saree. 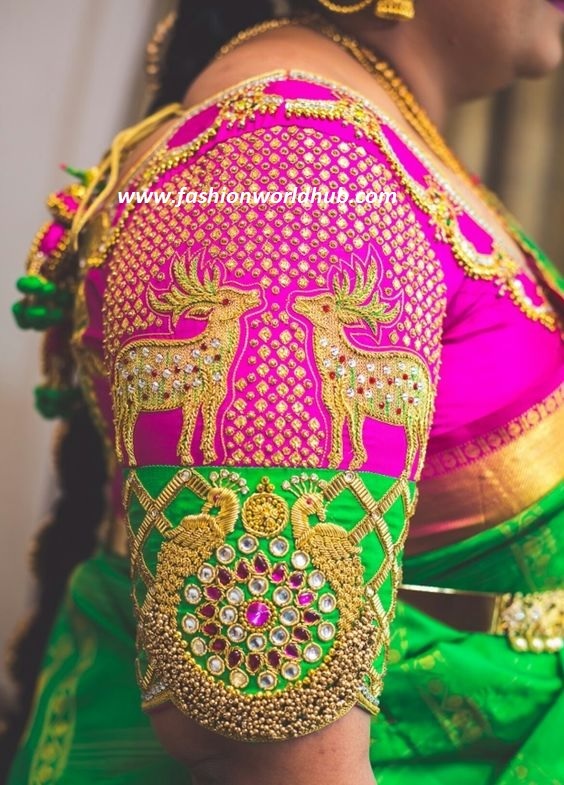 Specially in Animal designs, deer and elephant design blouse made the blouses hit and in bird designs parrot and peacock designs with elbow length sleeves are one of the outstanding combination. 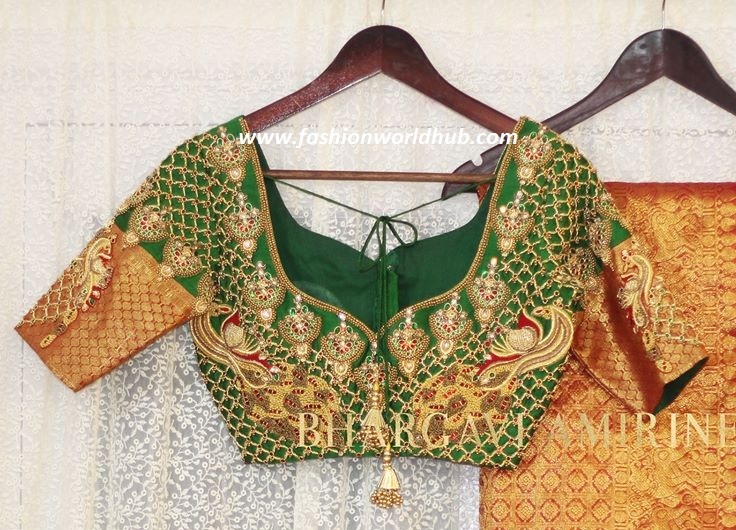 Bride in pallaki and baraat scene Blouses :- One of the perfect wedding blouse is bride in pallaki and baraat scene blouse . 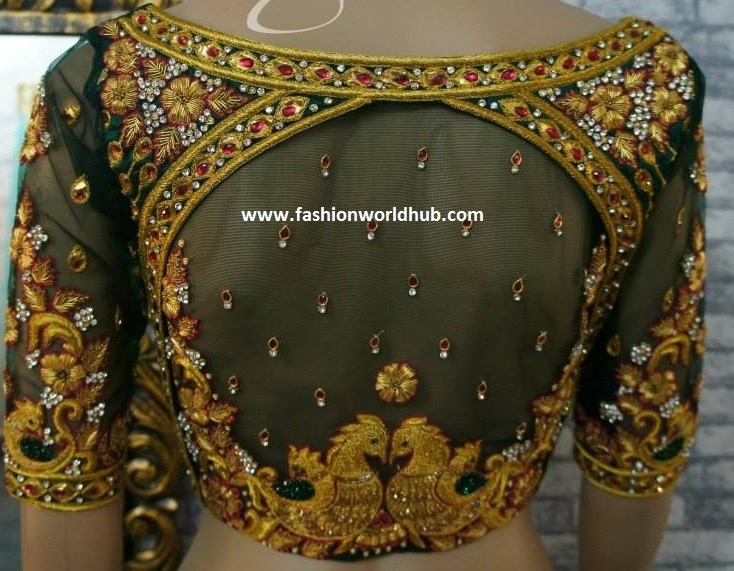 This perfect design on the back of the blouse is with colour embroidery work designs are going to rock in 2018 as well. Have a glance of this blouses. 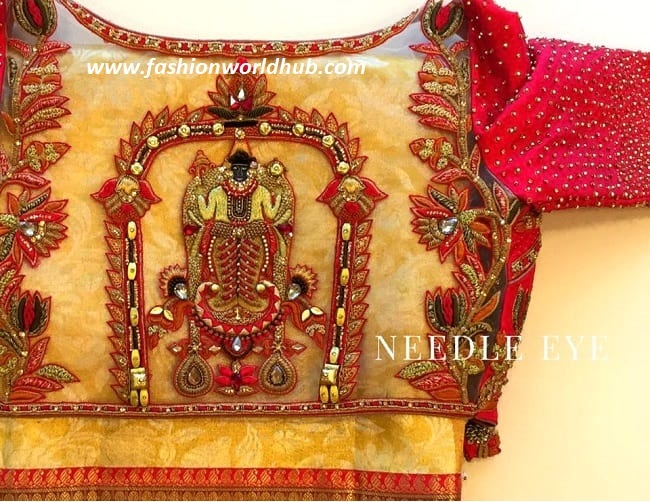 Traditional blouses are goddess and lord blouse designs. 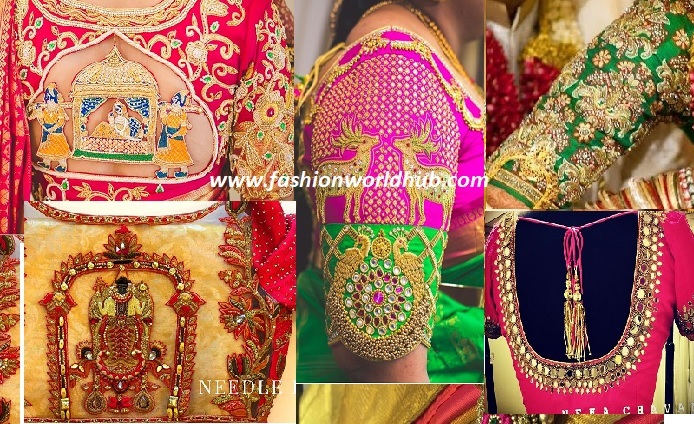 Lord venkateswara blouses, goddess lakshmi devi and other goddess blouses on the back neck and on hands went high trend. Here are the sample proofs. 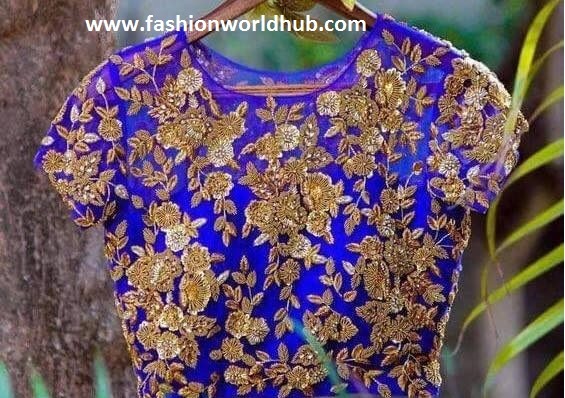 Floral zardosi work blouses :- Another blouse design that is going to be trend in 2018 is floral design work blouse. 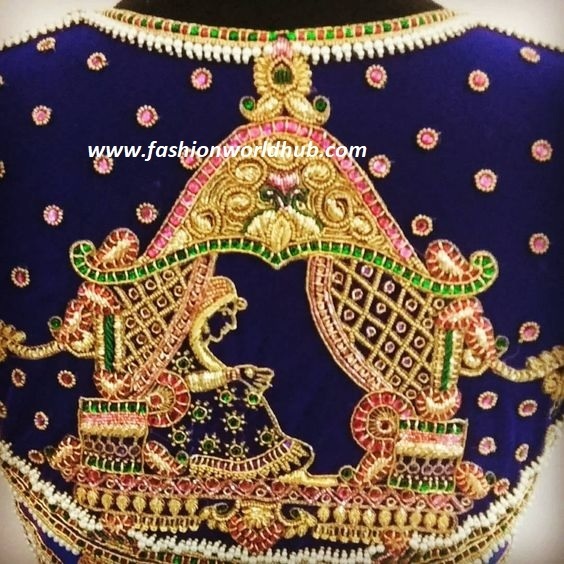 Floral zardosi work which is all over work with floral zardosi work embellished with stones. 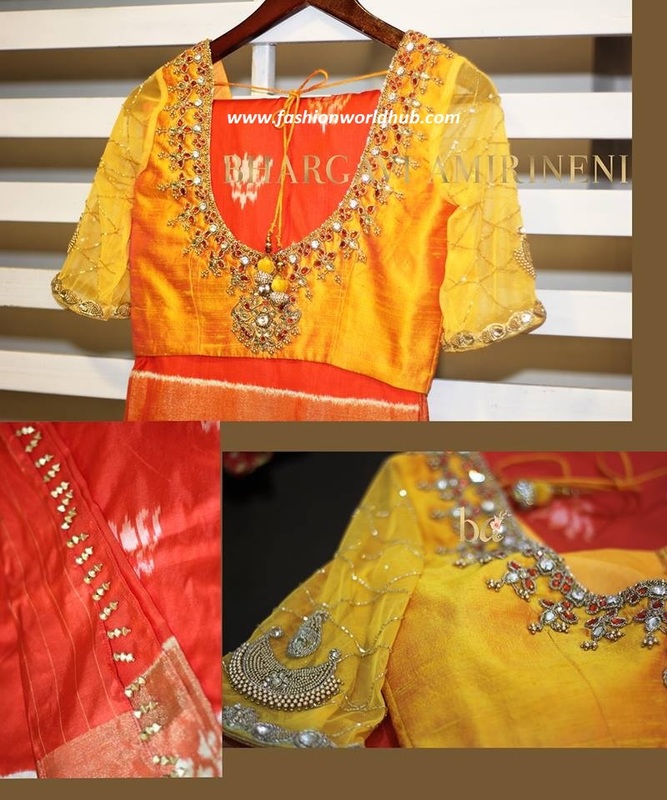 one of the perfect blouse for wedding and for a wedding attendee as well. 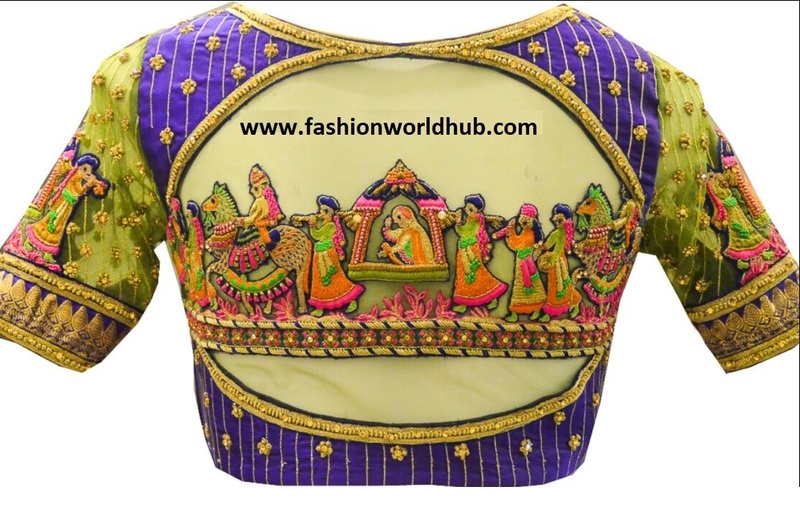 Beautiful Peacock maggam work blouse.